Bored on a Saturday, wife is flying, why not get a hot dog and catch a flick? Did I mention it was a bad flick? It wasn't supposed to be, but it worked out that way. 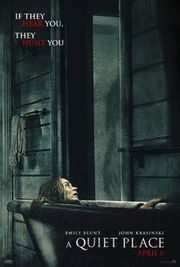 Rotten Tomatoes gave it an 97/87, so I figured something fresh and interesting, in the suspense/thriller/horror genre. Yeah, not-so-much. While it was reasonable acted, shot, and so on... the premise of the dumbest people alive, kind of ruined it for me. There's no way to kvetch on this one without spoilers, so if that matters to you, stop here. The premise of something bad getting good people, is as old as time. As is people adapting to adversity. The premise of them having to learn to be quiet, or fast monsters would kill them, was somewhat intriguing, and could have been fresh. And the movie was fairly Hitchcockian, in its pacing and that it was a lot about the suspense and drama, than pure action. While that pacing is slow for some people, I thought it was good on that dimension. It was kind of like The Walking Dead... only with armored aliens (d'Artagnan/"Dart") out of Stranger Things. It starts week (and then year) into the post-apocolypse brought forth by a meteor impact brought these creatures to our planet. Which means there must be a lot of them, and they must breed incredibly quickly. The whole movie was basically about avoiding these things, because they're very fast, armored, and virtually indestructible. So it's another "find the weakness" film. Only anyone could figure that out in about 5-10 minutes. Try to guess the big reveal. Creatures are blind but hunt by sound. We have a deaf girl in the film. The whole movie is about being quiet (including the title). They're armored and indestructible, but the writers needed a war-of-the-world twist to make them vulnerable.... what could that possibly be? Why, it couldn't possibly be sound, could it? Duh! If you know the rules (that they're attracted to sound), and our protagonists had time to dump tons of sand around to walk on (and muffle their noise), you start thinking, why couldn't you put a boom box behind a wheat thresher or something to lure these things to their death? Or at least setup remote sound distractors for when the things got to close? Why couldn't you build soundproof rooms in your basement? Or just build sonic fencing to keep them away, or distract them if they entered your area (a few loudspeakers at the top of poles). Then there's how fast they must breed to have taken over the planet in a few weeks (or even 16 months), or the whole falling into a silo, and grain turns into quicksand for the kids, but the monsters walk on it just fine? (That's not how grain works). There hasn't been plot-holes this big since Jeff Goldblum hacked an Alien super-ship using a Macintosh in Independence Day (1996). Or since Obi-Wan cunningly hid Anakin Skywalker's (Darth Vader) son from him, by taking him back to Vaders home planet, leaving him with his cousins, and keeping the Skywalker surname. Then at the end, there was parental sacrifice, Mom becomes Fembo (the maternal version of Rambo), Daddy told his angst-ridden teen daughter that he loved her, and monsters that have wiped out virtually all of humanity across the planet, are thwarted by a Cochlear implant and a pump shotgun? I can suspend enough disbelief to watch SuperHero TV shows... but that was a bit too much for me. This page was last edited on 25 March 2019, at 02:17.